Presently living in Montréal, Deanne has been a practicing artist for many years. She has gone through various subject and media exploration, doing etching, woodcut, oil, pen & ink, pencil, watercolour and, presently, collage. 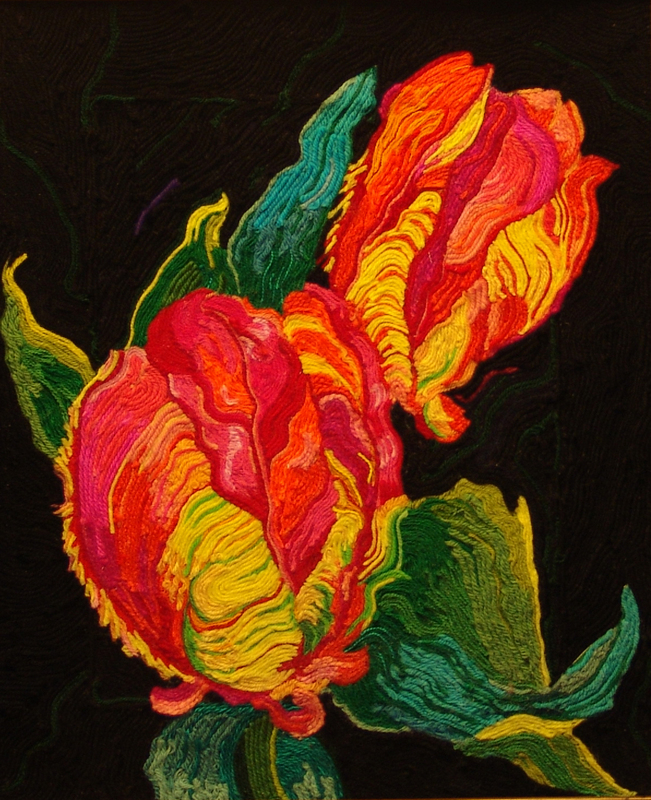 Since 2000 she has been doing larger than life flowers in oil, measuring from 16” x 20” to 2’ x 3’. In many of her paintings she has combined patterned tiles and vases with the flowers. After arriving in Montréal in 2005, she was intrigued with the distinctive architecture of Montréal and began producing coloured pencil drawings of street scenes. These drawings are basis for her colourful fantasy collages where she exploited the textures, patterns and colors of fabric. Yarn is another medium Deanne is exploring yarn ‘paintings’ using the lines of the yarn in the same way one uses strokes of paint. Subjects for the yarn paintings are flowers, still life, and sunsets. Also an art educator, she has taught in Montréal and Wisconsin. The greater part of her teaching career has been overseas in Bahrain. There she taught art to kindergarten, high school and adults. Back in Montréal, she continues art instruction to children and adults.